The University of North Carolina at Charlotte began as a temporary junior college established to ease an enrollment crisis created by World War II veterans seeking an education under the GI Bill of Rights. Its development into North Carolina's fourth-largest university parallels the rise of many other urban universities across the United States, all established in response to a dramatic increase in public demand for higher education during the postwar era. In 1946 state officials, anticipating overcrowding at traditional colleges and universities, moved to create temporary college centers across the state, operating under the auspices of the Extension Division of the University of North Carolina at Chapel Hill. With an enrollment of 278 men and women, the Charlotte Center opened on 23 Sept. 1946 as the largest of 14 such institutions. It operated as a night school in the facilities of Charlotte's Central High School and offered credits transferable to any senior institution in the state. When the enrollment crisis eased in 1949, state officials closed the temporary centers, but Charlotte residents, who had long sought a public institution of higher learning for their community, arranged to have the city school board take over the center and operate it as Charlotte College, funded by local revenues. In 1958 Charlotte College became part of the North Carolina Community College System. In 1961 it was moved to what would become a 1,000-acre campus about ten miles northeast of Charlotte. In 1964 it became a four-year college, and in 1965, with an enrollment of 1,815, it became the fourth campus of the consolidated University of North Carolina System. 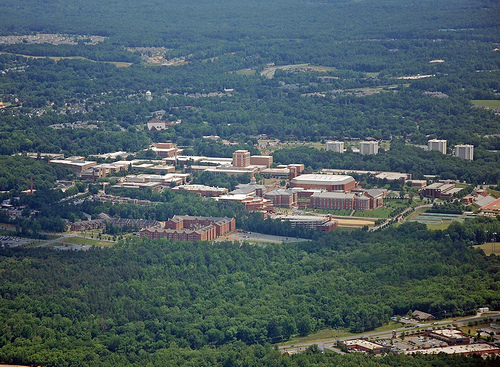 Initially a school for commuters, the University of North Carolina at Charlotte in 1968 opened its first residence halls and began to grow rapidly. In 1969 it began offering programs leading to master's degrees and in 1993 programs leading to Ph.D. degrees. In August 2000 the Board of Governors of the University of North Carolina System reclassified it a doctoral/research university. The modern University of North Carolina at Charlotte is comprised of seven colleges: Architecture, Arts and Sciences, Business Administration, Education, Engineering, Information Technology, and Nursing and Health Professions. It draws students from across North Carolina and the nation and around the world. In the early 2000s it had an enrollment of more than 18,000 students. The university serves both students and the Charlotte community through its research centers, including the C. C. Cameron Applied Research Center and the Ben Craig Center. Its affiliation with the 3,200-acre University Research Park, established in 1966 to encourage industry-university relationships, has been successful, resulting in more than 40 companies employing approximately 25,000 workers. Mike Hermann, Vision, Engineering and Science: The Founding of the C. C. Cameron Applied Research Center (1999). Arnold K. King, The Multicampus University of North Carolina Comes of Age, 1956-1986 (1987). Ken Sanford, Charlotte and UNC-Charlotte, Growing up Together (1996). Willamor, James. 2007. "Charlotte Aerial Photography." Online at http://www.flickr.com/photos/bz3rk/3560134805. Accessed 10/29/2012.